Twelve people, including police, journalists and cartoonists were killed today at the headquarters of “Charlie Hebdo,” a satirical magazine in Paris. 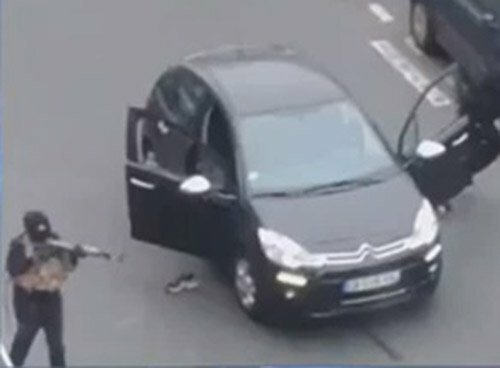 A masked gunman outside the Charlie Hebdo offices in Paris. The offices of Charlie Hebdo had been attacked and firebombed previously, in the past few years. The black masked killers proclaimed that “Charlie Hebdo is dead,” but they are wrong. Charlie Hebdo is very much alive, and spontaneous protests are taking place all over France, supporting their freedom of speech. “We condemn this horrific attack on a media outlet and its staff – the worst such attack globally in the past five years – as a direct threat to the right of freedom of expression in France, and to us all. Silencing the messenger is the worst form of censorship, made even more abhorrent by violence.” – Karin Karlekar, director of the Freedom of the Press project at Freedom House. President Hollande declared a day of mourning, and called for a minute of silence at noon. 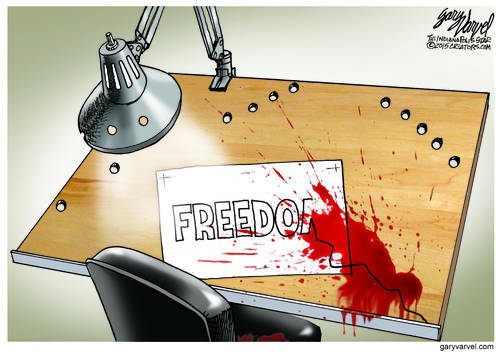 Secretary Kerry said the freedom of expression represented by Charlie Hebdo is not able to be killed by this kind of act of terror. It will serve to strengthen the commitment to freedom of the civilized world.